A stand-out Selection of Period and Vintage Pieces and A rare Collection of 18th Century Jewellery Designs To lead Sotheby’s London Sale on 18 March 2015. Sotheby’s London Fine Jewels sale on 18 March 2015 will present a stand-out selection of exceptionally crafted period jewels of and vintage pieces signed by some of the world’s greatest makers, including Cartier, Bulgari and Boucheron. Covering defining eras of jewellery design, from delicate creations of the 18th century, to the sophistication of Art Deco and the glamour of modern style, the auction is also distinguished with a rare collection of jewellery designs from the 1780s. The centrepiece of this spring’s sale is a rarity: a collection of 23 jewellery designs from the second half of the 18th century. These drawings, probably in life size, display an asymmetrical, serendipitous flavor and typify the light and open designs of the period. Utilising flowers, leaves, ribbons and tassels, the format would suggest that they were assembled for potential distribution to goldsmiths (est. £40,000- 60,000/ €54,000-80,500/ $60,000-90,000, illustrated below). The period jewel section comprises superb examples of late 19th century jewellery, including two emerald and diamond brooches/pendants. The first features a square step-cut Colombian emerald set within an openwork scroll frame with circular-cut, cushion-shaped and rose diamonds (est. £20,000-30,000 / €26,800-40,200 / $30,000-45,000). The second, of foliate and scroll design, set with a trapeze-shaped emerald, also of Colombian origin, circular-cut and rose diamonds (est. £12,000-15,000 / €16,100-20,100 / $18,000-22,500). Henri Picq’s Paris workshop in the Marais was responsible, from the early years of the 20th century through into the late 1920s, for some of the most iconic designs of the period. Working largely, though not exclusively, for Cartier, they pioneered the use of novel materials and executed some of Cartier’s most avant-garde creations. 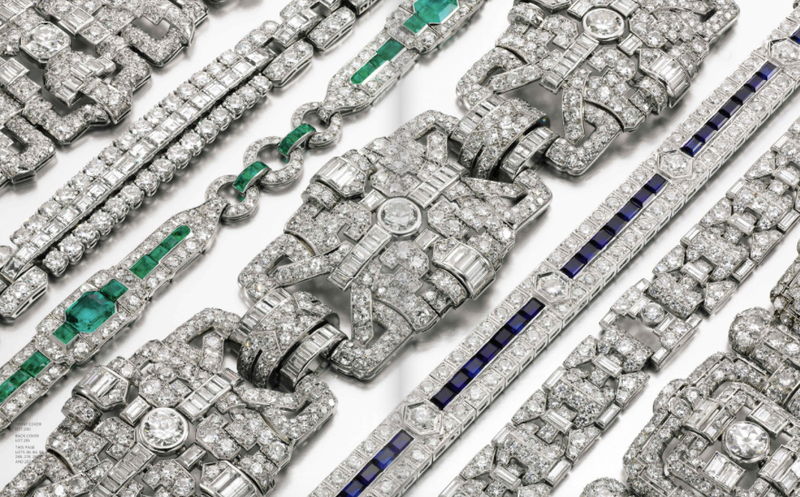 Picq was the creator of the very first of Cartier’s ‘tutti frutti’ jewels, at the time described simply as ‘pierres de couleur’, which was a bracelet designed for the Paris Exposition Universelle in 1925. Made in the 1920s, this garland brooch, set with carved emeralds, rubies and sapphires and circular-cut, baguette and marquise-shaped diamonds, is an early and stunning example of ‘tutti frutti’ design (est. £3,000-5,000 / €4,050-6,700 / $4,500-7,500, pictured right). Cartier features strongly in the sale, with a superb coral, enamel and diamond brooch from the 1930s, designed as a ladybird (est. £6,000-8,000 / €8,100-10,800 / $9,000-12,000, pictured left) and a diamond brooch from 1940s in the shape of a fox, set with variously cut citrines, pear-shaped emeralds and a trapeze-shaped sapphire (est. £6,000-8,000 / €8,100-10,800 / $9,000-12,000). Highly sought after, rubies are well represented in the sale, as seen in an emerald, ruby and diamond brooch, Marchak, 1960s, in the form of a rose (est. £10,000-15,000 / €13,400-20,100 / $15,000-22,500, illustrated above together with the ladybug) and a magnificent ruby and diamond pendant, claw-set with a kite-shaped ruby within a surround of brilliant-cut, pear- and marquise-shaped diamonds. (est. £3,000-5,000 /€4,050-6,700 / $4,500-7,500, here below). The sale also includes a number of gentleman’s accessories by some of the world’s leading makers. Capturing the powerful aesthetic of Verdura is a pair of diamond cufflinks (est. £2,500-3,500/ €3,350-4,700 / $3,750-5,300), while the discreet and timeless elegance of the pearl is exemplified in an irresistible pair of natural pearl, cultured pearl and diamond cufflinks (est. £2,000-3,000 / €2,700- 4,050 / $3,000-4,500) and a lot comprising three natural pearl and diamond buttons by Bulgari (est. £2,500-3,500 / €3,350-4,700 / $3,750-5,300). As I do love period and vintage jewellery, here are a few more picks which cannot be missed out of this auction. Post by Claudia Carletti, Jewellery Through Time. Material from Sotheby’s website.